The Audio-Technica AT2020USB+ lets you record directly to your laptop or PC for a truly simple home studio setup — without compromising on recording quality. This rugged side-address condenser microphone features a low-mass diaphragm that's custom-engineered for optimal frequency response and transient response. That means you'll be able to capture vocals and instruments with clarity and precision. The mic comes with a tripod desktop stand, and a built-in analog-to-digital converter gives you accurate, detailed recordings. Just connect the included mic's USB cable to your laptop or desktop computer and start recording with your favorite digital audio workstation software. 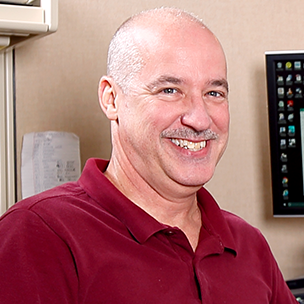 The AT2020USB+ is compatible with both Windows® and Mac® operating systems. The included tripod stand is sized to place the mic comfortably on your desk or table, perfect for recording podcasts. 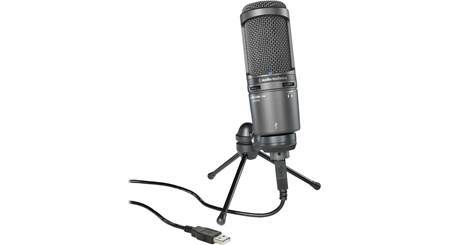 Overview: The Audio-Technica AT2020USB+ is a side-address, cardioid condenser USB microphone that is designed to plug directly into your computer via the supplied USB cable. 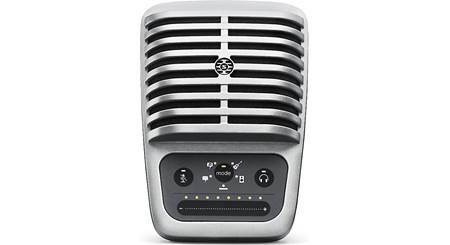 It is ideal for home recording, field recording, podcasting, and voiceovers. 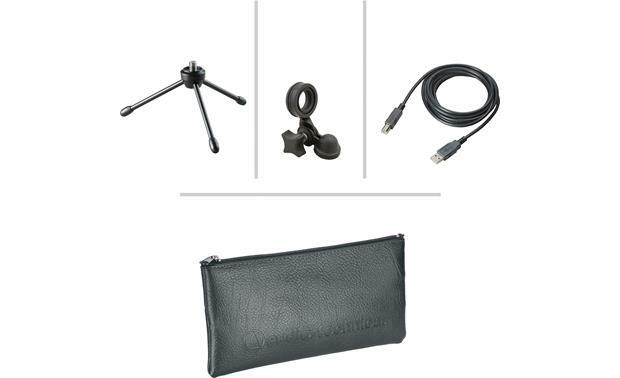 In addition to the USB cable, the AT2020USB+ comes with an adjustable stand adapter, a thread adapter, a tripod desk stand, and a zippered storage pouch. Side-Address: The AT2020USB+ is designed to be mounted upright, with the front of the microphone placed directly in front of the sound source. The front of the microphone has the Audio-Technica logo, while the back is labeled "Back." Cardioid Pattern: The microphone's cardioid polar pattern picks up sounds from one side (front), and rejects sounds from the sides and rear. This isolates the desired sound source from other sound sources to give you the best possible results, and helps control feedback. 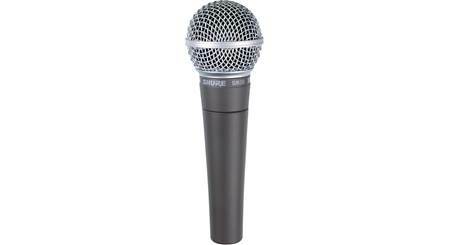 Digital Output: This USB microphone is equipped with a high quality A/D and D/A converter with a bit depth of 16 bits and a sampling rate of 44.1/48 kHz. Headphone Output: For latency-free monitoring, the microphone has a 3.5mm headphone output. This high-output internal headphone amplifier lets you monitor your subject with clarity and detail, and provides additional volume for critical listening. The headphone level control only adjusts the mic's headphone output, and not the microphone level. Mix Control: You can monitor previously recorded tracks while recording new audio. The Mix Control dial lets you balance the levels of the live audio and the prerecorded audio on your computer. Compatibility: The AT2020USB+ is compatible with USB 2.0 and 1.1, and the following operating systems: Windows 7, Windows Vista, Windows XP, and Mac OS X.
Tripod / Stand Adapter: The AT2020USB+ includes a small tripod desk stand with folding legs, and a pivoting, threaded stand mount. The mount has a 5/8"-27 thread, plus a thread adapter for 3/8"-16 microphone stands. 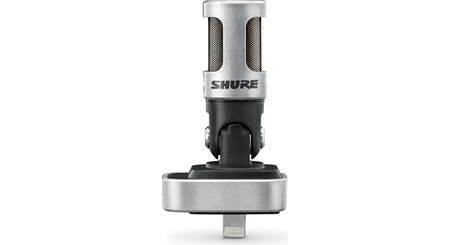 USB Power: This condenser microphone requires power in order to operate. It receives power (5V DC) from your computer's USB port, and through the supplied USB cable. 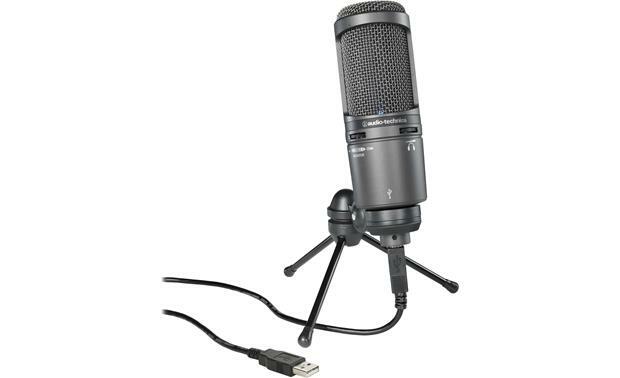 Dimensions: Diameter: 2.042", Length: 6.379"
Searches related to the Audio-Technica AT2020USB+ Large-diaphragm cardioid condenser microphone with USB.